The Laskett Gardens are one of the largest private formal gardens to be laid out in England since 1945. They form an ever evolving creation over forty years of the historian, writer and diarist Sir Roy Strong and his late wife, the designer, Julia Trevelyan Oman. Stretching over four acres, it is celebrated for the orchestration of surprise and its thrilling vistas. 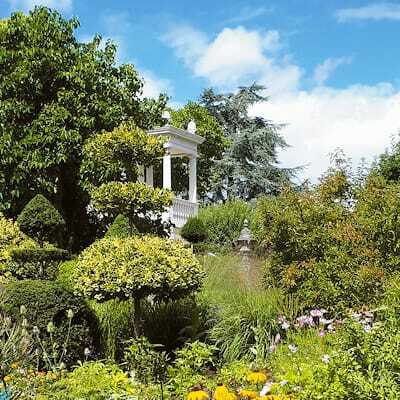 There are some twenty different and contrasting ‘rooms’ including a rose garden, a knot garden, an orchard, a pleached lime avenue, parterres, herbaceous borders and the Colonnade Court. Visitors will see new additions to the Gardens in 2019 including two new mosaics and a spectacular Italianate Belvedere from which to view the gardens from on high - this is not to be missed! This is the Sissinghurst of the late twentieth century, a joint creation by two people who were at the centre of the arts in England embracing theatre, opera, ballet, film, museums, exhibitions, garden design as well as writing. What makes this garden utterly unique is that its makers wove the story of their marriage and their lives into its very fabric. Opening times: Tuesdays and Thursdays from 30th April to 26th September. Other times by appointment. Admission Rates: £12.00 Includes a detailed souvenir map of the gardens & an audio guide. Group Rates: Minimum Group Size 20 although we can accommodate smaller groups by arrangement. Facilities: A small shop selling items exclusive to The Laskett Gardens. Only plants grown in the garden are sold. Recommendations of local places to eat are available. We do not have a tea room but visitors are welcome to bring their own refreshments to enjoy in the gardens. We can arrange picnics to be enjoyed in the garden or for taking away - please e-mail Fiona Fyshe for further information. Disabled Access: Limited but possible. Toilets on Site: 3 unisex including disabled facilities. Coach/Car Parking: Yes. The larger coaches can set down, collect and park nearby. Length of Visit: 11/2 – 2 hours. Special Events: Early evening summer openings can be made by special arrangement to include a glass of wine, fizz or Laskett Apple Juice and nibbles if required.